Did You Know – These 10 Ways To Use Lettuce ? As you can probably guess I love my food and most of all I love healthy food and am always looking for new ways to serve it. Well here is some ways to make lettuce more interesting, tasty and great ways to serve. 3. Spring Soup – bring 2 cups liquid no added salt stock and 1 cup of water to the boil. Add 1 chopped leek (white part only), half a bunch chopped celery, half cup peas and a pinch of sugar, Simmer for 20 minutes adding a small head of chopped lettuce in the last 5 minutes of cooking.Top with croutons and parmesan cheese. 4. Egg cups – Combine 2 chopped hard-boiled eggs with a wee dollop of reduced fat mayo and a pinch of curry powder or more if you like a bit more spice. Spoon into 2 lettuce cups to serve. 5. Fast and easy salad – Place 1 whole shredded lettuce in a bowl. Add shredded dill toasted pine nuts and finely sliced spring onion. Dress with an olive oil and white wine vinegar dressing toss before serving. 6. San Choy Bow – Stir fry cloves minced garlic, grated 3cm piece of fresh ginger, 150g sliced mushrooms and 500g lean pork mince until mince browns, Add 2 teaspoons sesame oil, 2 table salt reduced soy sauce and 2 tablespoons oyster sauce. Toss to combine. Remove from heat and fill lettuce cups with mixture. Top with bean sprouts, shredded snow peas, thinly sliced capsicum, fresh coriander and toasted sesame seeds. 7. Pea and lettuce stir fry – In a large frying pan stir fry 1 chopped onion, 1 teaspoon minced garlic and 4 stalks chopped celery until softened. Add half cup liquid no added salt stock, 2 cups frozen peas and a pinch of dried thyme. Simmer for 5 minutes then stir through 1 and half cups of shredded lettuce until wilted. 8. Vietnamese tofu lettuce wraps – thinly slice 1 packet of marinated tofu in strips. Heat in a small frying pan until warmed through. 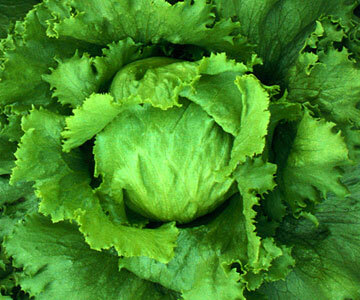 Wash 4-5 large iceberg lettuce leaves. Top each leaf with tofu strips, shredded coriander, roasted peanuts, torn fresh mint, grated carrot and shredded basil. Drizzle lightly with sesame oil and wrap leaf around filling.